Middlesex University's strong partnerships with schools across Greater London and surrounds provide valuable opportunities for students to nurture their skills in a supportive environment. 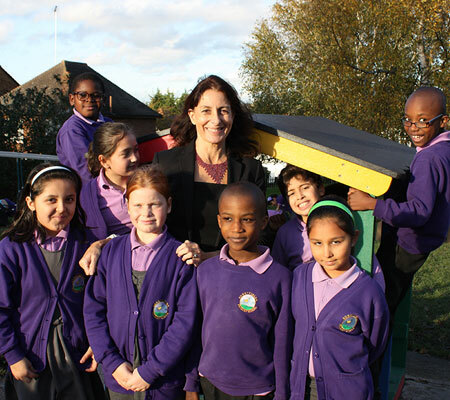 "Primary Education students from Middlesex University come to us every year for their teaching placements," says Lisa Meyer, Deputy Head Teacher at north London's Sunnyfields Primary School. "But we collaborate in other ways, too. We worked together on a great community project a while back where Middlesex art degree students helped our pupils paint murals on the nursery walls, it was lovely!" So what makes Sunnyfields such a terrific place for Middlesex students to train at? "We're a little school which means everybody knows each other and there's a real sense of community. When parents fill in the annual questionnaire they always comment on the family feel we've created. I think that rubs off on the trainees." As well as a friendly, close-knit atmosphere, Sunnyfields focuses on creating a fun learning environment. As 81% of the pupils speak English as an additional language, Lisa and her team feel it's important to bring lessons to life and make the curriculum as accessible as possible. "We believe children learn best when they're enjoying themselves," she says. "And though the pupils can be challenging sometimes, there are two teaching assistants in every class, so trainee teachers are always well supported." Sunnyfields is proud to be a Rights Respecting School through the UNICEF initiative, which teaches children their rights under the United Nations Convention, and promotes mutual respect. "We've found it really motivates them, because they have a better understanding of the world around them and the difficulties other children face. We're linked with an orphanage in Ghana, and our pupils appreciate how lucky they are to come to school every day when not every child can." Middlesex University students can expect many benefits from a placement at Sunnyfields. "They will be very warmly welcomed and embraced into the community," assures Lisa. "And we recognise that it's not just the children who are learning. We have volunteers go on to become staff, and teaching assistants who go on to train as teachers. I think it's because we really encourage everyone to believe in themselves. If you instil confidence in people, they'll come up trumps and it's wonderful."